How do you build a new flagship synthesizer — and how do you make it live up to a beloved past name? That’s the question Roland has taken on once again with the Jupiter-80. Shown to a select few starting at NAMM, then (very) non-intentionally leaked in the past few days, there’s a good chance you’ve seen it. But here, I’ll try to provide some technical details you may not know – thanks to ongoing conversations with Roland and the help of our friends at Keyboard – and also look back to the original Jupiter-8. Whether the resulting keyboard is for you, I think that reveals something of the path of one of the world’s great synth makers, and perhaps explains some of the impassioned reactions (positive and negative) to a new Roland. The Jupiter-80’s predecessor, the Jupiter-8. The Jupiter-80 isn’t this – note all those physical controls. But there are ways in which the two Jupiters promise to be related in more than name. Photo (CC-BY-SA) Ed Uthman. 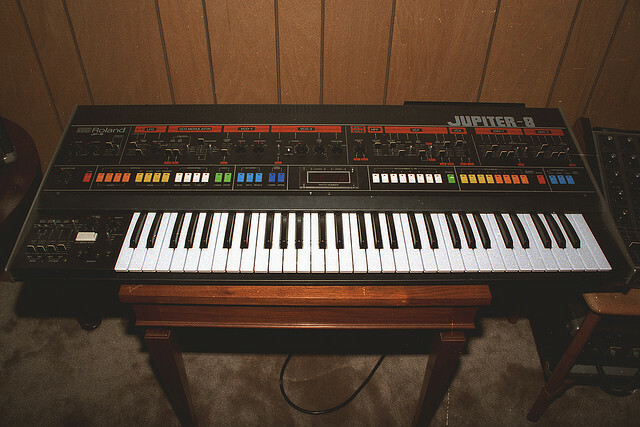 Let’s get this out of the way: the Jupiter-80 isn’t directly based on the landmark 1981 Jupiter-8. And full disclosure: in the past, I’ve questioned whether Roland’s past monikers always fit the new models, as with their Juno-G. But let’s consider the original Jupiter-8 for a moment. To most of us today, it’s the Jupiter as analog synth (technically, analog-digital hybrid synth) that we love. But that’s not the only story on the Jupiter. 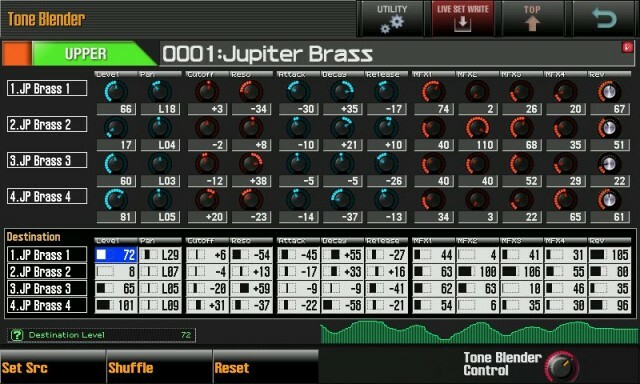 If it were, the Jupiter might be lost among other synths of the era. Gordon Reid has written terrific histories of the Roland company and the Jupiter line. The opening section of his 1994 history of the company for Sound on Sound (“What have the Rolands ever done for us?”) is a must-read. Looking back through the original factory patch sheets, it’s also clear that the Jupiter-8 was intended as an device to simulate real instruments – a “synthesizer” in the truest sense. Remember that Roland’s history was intertwined with organ history. The Jupiter line was even designed in ways that could replace or augment organs, and certain features – attempting push-button access to the full range of acoustic instruments – owe their legacy to organs. They also were focused on economy and playability. Fortunately for us, the results – particularly Jupiter strings and brass – were idiomatic. Aiming for old sounds, Roland created new ones. 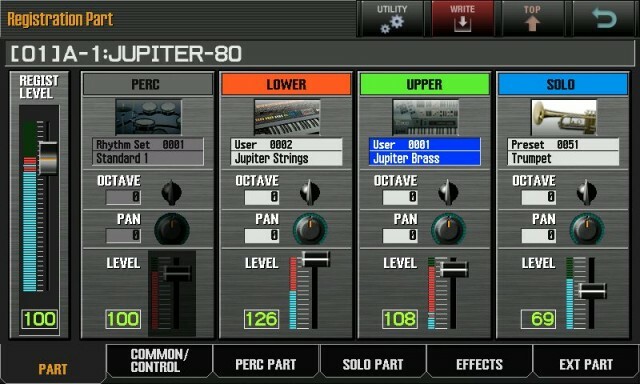 And that brings us to the Jupiter-80. The question is, what makes a Jupiter? Do you make a new synthesizer in the sense of synthesizing real instruments, or do you make something that’s a programmable electronic instrument in the sense of what analog synths mean to us now? The JP-80 does both, and that means the question of how well it meets those two goals will likely be high on the list as it is completed, shipped, and fully reviewed. A comparison is way out of the scope of this first-look article, but the Jupiter-80 contrasts with Korg’s KRONOS. The KRONOS is sold as “nine” keyboards in one, and it really is as much full-blown workstation as live keyboard. 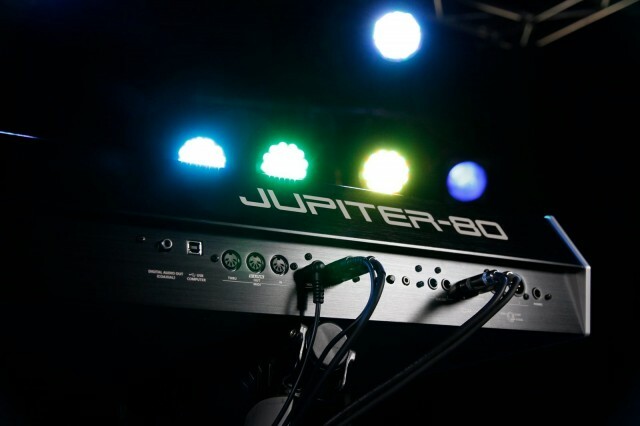 The Jupiter-80 is more about playing live. 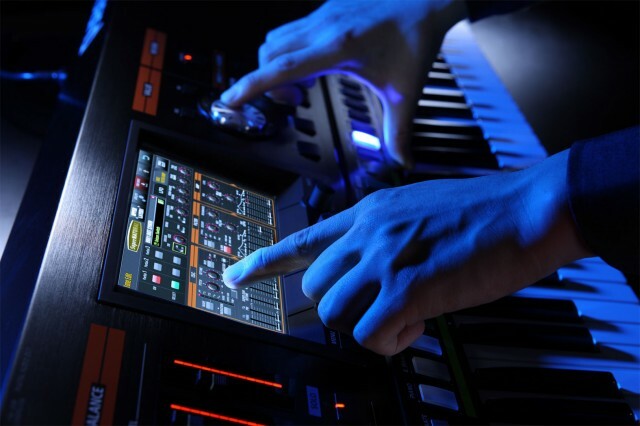 The KRONOS is built on an Intel Atom architecture similar to the OASYS distinct from any other Korg product; the Jupiter-80 has more in common with other new Roland synths. 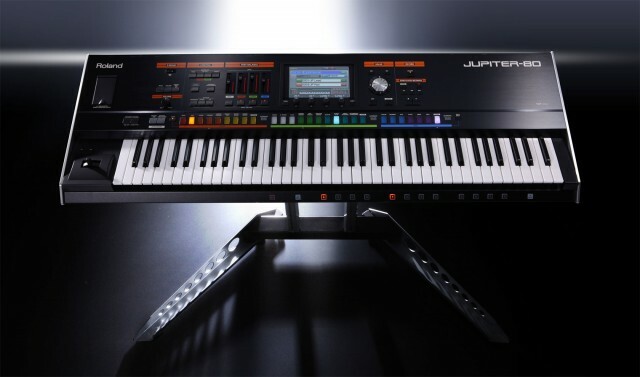 But – and this is where you’ll see some mixed reactions – the new JP is two synths in another way. It has tones that emulate real instruments and articulations, and then the sort of synth sounds that you’d expect for something that says Jupiter on it. Roland tells CDM that they view the original mission of the Jupiter-8 as being expressive, so to them the SuperNATURAL engine is a perfect fit for the Jupiter – even as synth purists and programmers may feel otherwise. But before you dismiss it, the interesting element is the way in which you can combine the two tones on keyboards. 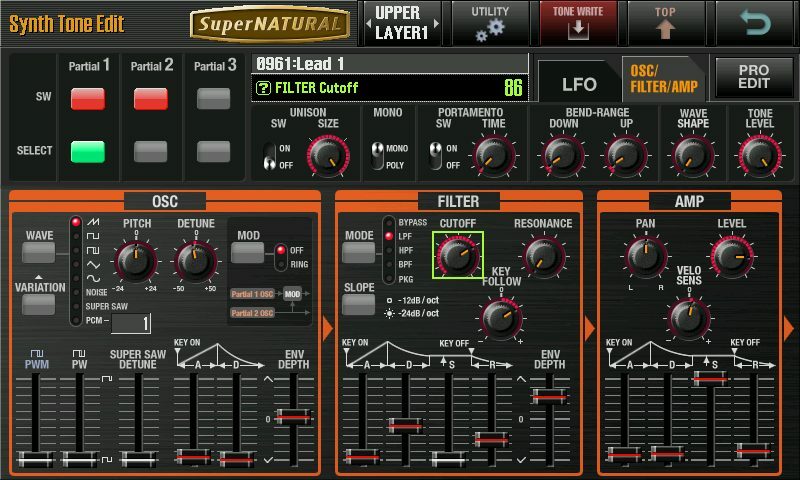 That isn’t hard to do on a computer, but if you prefer to play an all-in-one synth – or to do this on a single, integrated instrument – it’s compelling. And what the Jupiter isn’t – whatever you may have heard on the forums – is a ROMpler. The derivative term “ROMpler” refers to instruments that more or less play stock sampled sounds from internal memory with little live control or synthesis. The Jupiter-80’s architecture isn’t that, on either the simulation or synthesis sides. The SuperNATURAL engine has already appeared on new Roland organs and the V-Piano. The basic model is to provide sound content that’s pre-programmed to emulate real instrumental articulations from a keyboard. That’s always been a challenge to sampler designers. In big computer sample libraries, you’ll find all sorts of tricks for key switching and sample variations and other ways of providing the full range of instrumental articulations on a keyboard. (The piano, after all, was never intended to do what a violin or erhu can.) The SuperNATURAL engine attempts to make those more immediately playable. What happens when a keyboardist is trying to reproduce sounds other than a traditional keyboard instrument on the synthesizer? This is where synthesizers today really fall short because the typical sound engine inside cannot truly “interpret” an expressive keyboard performance done on keys into an authentic guitar, trumpet, or violin performance – a guitarist plucks or strums strings, a trumpet player uses his breath, lips and trumpet valves, and a violinist plucks or uses a bow on strings. All the keyboardist can do is trigger a static digital sonic picture of sound he is trying to recreate, and each time a key is pressed, the same sonic picture is repeated, but at different pitches as played on the keyboard. The Jupiter-80 solves this problem by using Roland’s newly developed Behavior Modeling technology. It takes care of the “interpretation” by constantly analyzing the keyboardist normal, natural keyboard performance, and instructs the ultra-realistic SuperNATURAL sound engines inside the Jupiter-80 to “play” and constantly “articulate” the reproduced sound just as the “real” performer would based on the keyboardists timing and interval between notes, the strength at which the various keys are struck, or if the keyboardist is pressing a pedal to sustain notes. These actions, among others available to the keyboardist, are translated by the behavior model for the selected sound being reproduced into an authentic plucked or strummed performance in the case of a guitar, aggressive or smooth bowing in the case of a violin, and the sharp or smooth pitch changes created by the valves on a trumpet and the pressure of the trumpet player’s breath. These are but a few of the articulations possible with Behavior Modeling. Vince tells CDM that he likes the analogy of the keyboardist in this case as akin to the conductor of an orchestra. There is a certain suspension of disbelief. There’s a reason I mentioned organs earlier – it’s not derogatory. Whether you deem it entirely successful or not, the Jupiter-80 is an attempt in the modern, digital age to stun audiences the way organs once did. 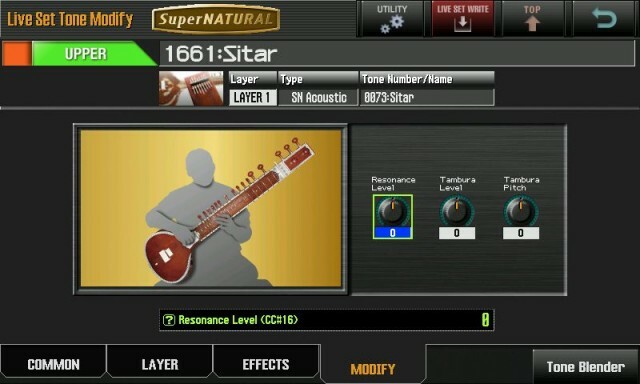 Okay, so you can have a really “magical” experience and play a keyboard and have it sound like an instrument. But for creative sound designers and synth lovers, does that mean you’re completely left in the dark? But one promising element – still in active development as I’ve been talking to Roland over the past weeks – is very much in the spirit of the original Jupiter-8, and that’s an emphasis on combining tones. The JP-80’s architecture allows the use of four tones, each with its own effects block, each with independent controls, on each of two layers – upper and lower – plus solo and percussion voices. That 2 x 4 + 1 + 1 in the architecture, which are then mixed together. The upper and lower voices each have reverb; solo and percussion have compressor, EQ, and delay. Touch-button access looks to make it very easy to mix sounds. 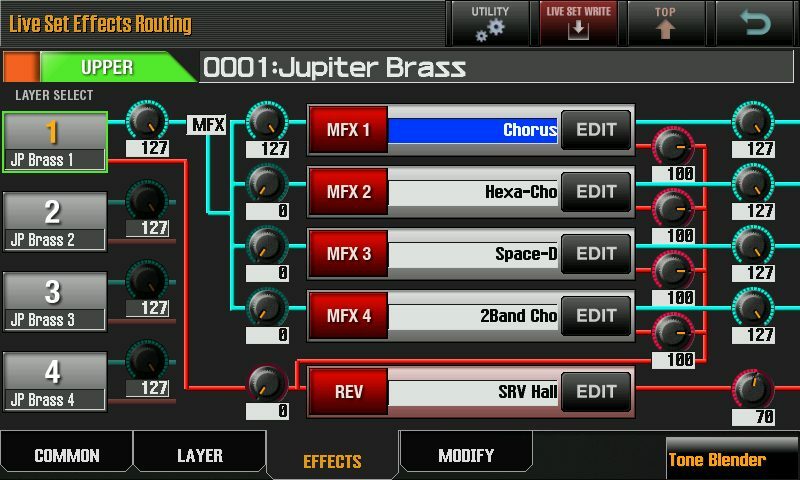 Starting with splits and layers, you’re already able to use the massive sound content on the JP to produce big hybrid textures. A Tone Blender function then allows you to work more with movement. The best way to understand what I mean is to look at the screen shots – these are prototype shots, so the final version may differ, but they give you a sense of what’s going on. And there’s no lack of sound design possibilities here. The Tone Blender mode, top, gives you some of these morphing possibilities. Below that image, registration and effects routings make complex, layered, playable sounds. It will allow one controller in, then map it to parameters of all 4 tones in a Live Set. I’m not sure how that works when you stack an upper and lower (8 tones), but will dig in more tomorrow. Also there is some extensive controller routing for each MFX used in a live set, of which I think can be addressed with the tone blender. Another cool thing is how you can stack 27 oscillators, each with independent filter, amp, and LFO. Each “synth” tone has 3 oscillators (called “partials” with independent filter, amp, and LFO), and if you use Upper, Lower, and Solo parts, that’s 9 tones. 9×3=27. We’ve also modeled the JUPITER-8s UNISON mode, so if that get’s dropped into the equation, you’re up in the 70s! Can you say thick?! While Roland isn’t introducing the 21st Century polyphonic analog synth of our dreams, what they tell CDM they are doing is modeling a wide variety of classic synthesis sounds, meaning this should still provide plenty of sound content for those tastes. Exactly how they’re modeling it and how the architecture works is something I expect to learn in coming weeks. Based on comments I’ve seen and heard, this may not be your cup of tea. The visual look, borrowing heavily from the original, is more of an acquired taste when placed into a modern context. And yes, of course, from sampled instruments to flexible sound design, the JP-80 really does have to compete now with software. That, combined with the cost of any of these keyboards, may mean that for hardware purposes many will prefer more focused designs to these sorts of flagship monsters. But different as those audiences may be, I do think everything from simple soft synths to big keyboards deserve to be compared on their merits, and compared to each other. So I look forward to seeing what the JP-80 has done, and playing a finished version. And as for whether you’d still want a Jupiter-8, perhaps in place of this newer Jupiter-80? Well, that remains an interesting question. It’s not easy being Roland: they company has a legacy with which to compete, too. Stay tuned, and let us know questions – Roland folk are standing by to deal with us harassing them answer our questions. From Sonic State, a session with Howard Jones, who worked on sound design with this instrument. Keyboard Magazine shoots some footage of the engineers from Japan; typically these folks don’t talk to English-language press, so I do find it interesting when we get to hear from them. People are saying they want more “analog,” but they’re also saying they want “cheap.” I suspect what people may really want is not a new Jupiter-8, but a new Jupiter 6 – or a new version of the Curtis CEM that powered it. These brilliant, economical, musical chips were the sound of a generation of instruments. It was the combination of inexpensive digital technology (which Roland helped promote) and this chip that made synthesis accessible. James Grahame, designer of our own MeeBlip synth, has even suggested this could be a DIY project, which would be very exciting, indeed. I would love to believe there’s a next Doug Curtis – the engineer for which the chip is named – out there somewhere. The point is that it’s the economical analog synth that people are imagining. Right now, polyphonic analog just isn’t economical – and given the capabilities of digital synthesis, it’s tough to make that choice. But if someone wants to imagine a new replacement for the Curtis CEM, that could change. Updated: Roland tells CDM tentative pricing is set at US$3999.